The BayAreaHiking group have had its mind set on hiking to the top of Half Dome in Yosemite since the beginning of the year. We have been preparing for this by hiking the Mission Peak trail in Fremont, CA since January 2009. We never could imagine how difficult it would be to accomplish the climb, but with perseverance and support from our fellow hikers the group succeeded in achieving this mighty goal. Some notes and pictures from our trip to Yosemite National park and our hike can be seen here. Group hiked the Mission Peak Regional Reserve every Saturday starting January 2009. Two days some of us hiked Mission Peak twice, to get a feel of hiking for longer periods, to gauge how we would handle these longer hikes. We hiked the normal (more popular) trail mostly and then switched over to the steeper trail on the South side. Everyone agrees the switch made a big difference and prepared us better for the steep incline towards Half Dome. Some of us carried backpacks weighing over 10 pounds as we were expected to bring water and some food for the real hike. Although we have been trying to reserve cabins in Curry Village since March, we were unable to find openings until exactly 1 month before our trip. We were able to reserve 2 unheated canvas tent/cabins at Curry Village using http://www.yosemitepark.com Each had 4 beds and cost about $120 per night. It is highly recommended to stay inside the park, and preferably at Yosemite Valley if you are planning to do this hike. It was a very short walk to the trail head from our cabins, and all the amenities are within walking distance. The first group started from the Bay Area around noon on Friday, and drove leisurely to the park making a few stops on the way. They arrived at the park around 5 and visited the meadow near Yosemite Fall, Yosemite Lodge etc. before checking in. The group parked at Curry Village and did not drive again until it was time to leave the park. The shuttle buses are a great way to cover Yosemite. Those run regularly from 6 AM until 10 PM and take visitors to most of the popular areas. The second group arrived around midnight and quickly went to bed anticipating an early morning start towards Half Dome. Although we planned to start the hike at 5 AM, we decided to start slightly later. By 6:30 AM we were all packed and started our journey. 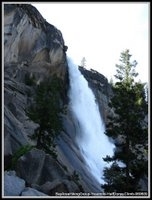 A quick walk to Happy Isles and then onto Vernal Fall and Nevada Fall helped the group stay ahead of the crowds. On our way, listening to the gushing water run offs from Vernal Fall stream was exciting. It gave us an idea how much water would be flowing at these falls after last winter's snow. Yosemite and the Sierras had lots of snow last winter and we knew the falls would be great! Early summer, as it proved, is the best time to see the falls at Yosemite. The lush greenery and the incredible water falls were a pleasure to behold! As we were hiking towards Vernal Fall we split into two groups. First group paced towards Vernal Fall as if they couldn't wait to start the climb towards Half Dome, and the second group was hiking at a slower pace. The second group picked up the pace after arriving at Vernal Fall and joined the lead team at Nevada Fall. Our continued practice hikes at Mission Peak enabled the group to arrive at the base of Half Dome with minimal discomfort. From the base of Half Dome, it was a study in perseverance and effort. It was purely mind over matter. The ascend to Half Dome became more and more difficult and the last part on the cables was very very tough. Climbing the black granite rock with no steps to stand on and clinging on the cables for dear life, waiting for the person in front to move up so one can take their place was excruciatingly hard. At times we would see walkie-talkies, water bottles etc. rolling down on the rock, and re-emphasize the dangers of what could occur if we were to lose our grip. One hiker, in her early twenties, had a panic attack due to the height (and may be lack of Oxygen), and had to be helped down to the base by her fellow hikers. We were hanging on the chains as she was being helped. Those folks who helped that young lady surely deserves many accolades as they were risking their own lives while helping her get to the bottom. It was very cold up at the top of Half Dome, and the iron chains were even colder! Having really solid gloves when holding the chains is a must! Make sure to carry leather gloves that cover all of your hands. We had one team member who used a glove with the edges missing (like those used when lifting weights) and he lost feeling on all his fingers! Even after 24 hours, feel to the fingers has not returned. From Nevada Fall, it is 5.2 miles to the top of Half Dome. It is a long hike to the base, so take your time getting to the base. Eat a high-carb dinner, a good night's sleep and eat a solid breakfast before the hike. Carry just enough water, getorade and food (including fruits) for you. DO NOT over-stuff your backpack. Bring a pair of hiking sticks. Those really help - especially when you are coming down the mountain. Try your best to hike with someone, and don't hike alone. Pace yourself. It is a very long hike that takes 12 hours round-trip. Enjoy the hike, and don't forget to stop and appreciate the beautiful park! We are thrilled to be able to complete this huge task without anyone getting hurt! Everyone had a great time at the park and we couldn't have asked for a more fun group for this! We are appreciative of the efforts of our family, friends and well-wishers who accommodated us with our weekly hikes as well as our big trip. Without their enthusiastic support and encouragement this trip wouldn't have been possible. Thanks! Cabins (heated and unheated), camp grounds, hotel rooms etc. at Yosemite can be reserved 366 days in advance. It can be done online at http://www.yosemitepark.com and their cancellation policy allows us to cancel within 30 days of check-in date. Since there are bears in the valley, all food, drinks and toiletries are expected to be kept in bear-proof lockers. It is not a good idea to keep them in your car or in your tent cabins. It is a good idea to take one or two small locks for these storage lockers. It takes over 4 hours to get to Yosemite from the Bay Area. If you are planning to travel during winter months, please carry tire-chains. If you are stopped by CHP you may be asked to show the chains, and failure to do somay result in a fine. There is a $20 per vehicle fee to enter the park. It entitles you to enter the park for 7 days. Please follow park rules. Please don't litter. Curry Village has excellent dining options - coffee shop, pizza, bar, buffet, taqueria etc. They also have a convenience store where you can get gifts, grocery and medicine. The food at these restaurants is very good, so you may only need to carry minimal amount of food into the park. Yosemite Lodge also has a food court and free WiFi. More pictures from our trip. All pictures from the trip, including those from Half Dome will be shared at a link soon. Home | Please send comments, corrections, and additions to Manoj. Thanks.